Lone Star Black Belt Academy offers a Kids Tae Kwon Do program that will help your child become confident, happy, and disciplined. These classes are designed to bring out the best of your child in a safe and encouraging environment led by our outstanding instructors! Our Kids Tae Kwon Do program is great for kids of all ages! We are fully staffed with individuals who are pros with children and will go great lengths to ensure your child gets the most out of every class. Step 1 Understanding it – Through class discussions and stories our instructors teach our children the meaning and benefit of having self-discipline. Step 2 Practicing it – During classes, our instructors help children to face and overcome challenges, soon they start to discipline themselves and begin to achieve on their own. Step 3 Applying it – Once our children successfully develop self-discipline in our school they begin to use it on the outside in everything thing they do, such as school and sports. This is why at Lone Star Black Belt Academy, we teach a realistic self-defense system that combines karate, kickboxing and submission grappling, so children learn to defend themselves in virtually any situation, whether they are standing up or on the ground. They also learn conflict resolution and when they should and shouldn’t use their skills. Children who learn self-defense become more assertive and less aggressive. The self-discipline to achieve goals: The self-defense skills to back them up so they don’t have to feel intimidated to stand up for what they believe. YOUR CHILD WON'T FALL BEHIND IN OUR AGE-APPROPRIATE CLASSES! Students in our Lil' Dragons program will learn life skills such as paying attention and following directions, self-discipline and self-control, respect, focus, patience, and overall sportsmanship. As well as Martial Arts techniques, our Lil' Dragons develop skills such as coordination, balance, flexibility, and strength. This program is specifically designed for children between ages 3-5. Lone Star Black Belt Academy is very dedicated to helping those with special needs. Mr. Jackson has had many years of experience in teaching children and adults who have Downs-Syndrome, ADD, ADHD, and Autism. He also has life experience from one of his most favorite people in the world, his sister, who has Downs-Syndrome. Beyond teaching Karate, in order to give an outlet to his special needs students, he was involved in coaching many other events for the local Special Olympics during his entire high school and college career. 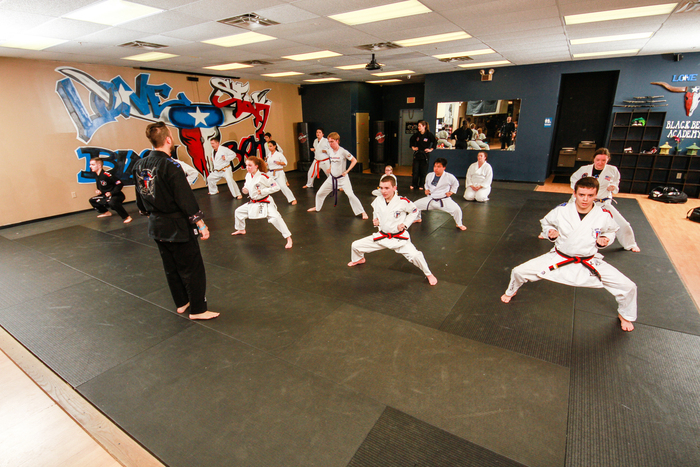 For great self-defense skills and easy fitness, Kids Brazilian Jiu Jitsu is a great class! This program will help your child focus and manage bullying situations. You'll notice a huge difference in their self-esteem and concentration levels. For more information on Brazilian Jiu Jitsu and what that Martial Art entails, visit our Brazilian Jiu Jitsu page here! Muay Thai Kickboxing is a fun combination of powerful kicks and punches and Martial Arts foundational skills. This is a non-competitive environment that will provide challenges and increase fitness and mental focus for your child! To learn even more about Muay Thai Kickboxing at Lone Star Black Belt Academy, click here! GIVE YOUR KIDS A KICKSTART TOWARD SUCCESS WITH KIDS TAE KWON DO! If you like the idea of giving your child a winning edge in life, there is no reason to hesitate! We offer a FREE trial class and FREE uniform when you sign up! Simply fill out the short form on the side of this page to get started today!